This item ships in 7-10 days on average. It will drop ship from our online partner. We will confirm the current lead-time upon receiving your order, or call 866-804-1909 to confirm in advance. This beautiful contemporary square fire table provides the perfect ambiance for outdoor living. The elegance and function of its design is the ideal complement for enjoying breezy nights on the deck or patio. An impressive centerpiece for entertaining or relaxing, its height and size is comfortable for both conversation and dining through all seasons. The optional glass guard surround provides protection from the elements and enhances the atmosphere with a beautiful reflection. The reinforced concrete base is inset with a floating burner and safety valve, which functions on propane gas, or can be converted to natural gas. The perfect level of warmth is achieved by manual ignition of the manageable flame over multi-colored lava rock; the fire table also includes a thermocouple and heat sensor as additional safety features. The propane tank (sold separately) can be cleverly concealed under the end table cover which serves as a functional complimentary piece. Founded in the beautiful climate of Vista, California, Sunset West knows a thing or two about enjoying the outdoors. 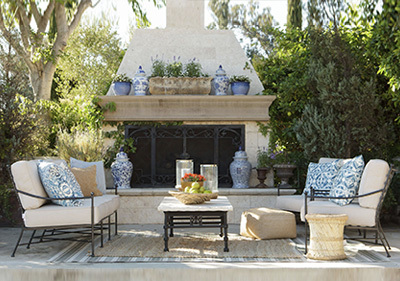 Their passion is bringing together, quality, comfort, design and value into the outdoor living space. Their collections are produced using a variety of materials from cast and extruded aluminum, to multiple shapes, textures and colors of resin wicker.